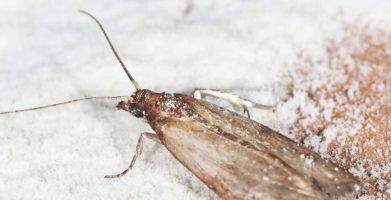 What to do about pantry moths in dog food and other pet food? How do Moths get in Pet Food and Why are They There? The moths that you find in pet food, as well as other dry goods and foods, are typically Indian meal moths. These moths and other pantry pests usually come into the home through food packages. The bag or box of food most likely became contaminated while it was at the factory or warehouse. Spoilage may also happen while sitting on a shelf in an infested environment such as a storage facility or during transportation. Pantry moths are attracted to dog food and other dry pet food because their eggs can be hidden easily. As soon as the moth eggs hatch into larvae, their feeding stage, the scavengers are right where they need to be – close to a food source. Noticing an infested bag of pet food may be difficult. The moths are likely to still be in their early egg stage. During the egg stage, the moth only measures about 1-2 hundredths of an inch. After hatching from the eggs, the larvae will measure up to ½ an inch and have a worm-like appearance. If you are not inspecting the food, which most of us aren’t, you will not recognize a moth problem until you spot an adult moth flying around. Once you see an adult moth, it has already gone from egg to larvae, and pupa to adult—with a female adult having the ability to lay up to 400 eggs within 2 weeks. Clearly, detecting or preventing a moth problem before this happens is important to get rid of moths that can reproduce so rapidly! What to do if Your Pet’s Food is Infested with Moths? If there are clear signs that moths have been inhabiting your dog’s or cat’s food, the food should be sealed up and thrown away. Sealing up the package before disposal will help ensure that other foods will not be contaminated as well. If there are other dry pet foods nearby, or foods that are in contact with the infested food, be sure to check them thoroughly. If they show no signs of moths, we recommend freezing the food for a week to kill any remaining eggs, just to be safe. The good news is that the pantry moth does not carry any diseases that will harm you or your pet. There is no need to worry if your dog eats food containing moths at any stage of their development. Although pantry moths are not a significant health risk, they are still unsightly. If the thought of serving your furry friend infested food sends shivers down your spine, take the time to check food for a moth presence. You can do this sifting through the first 4 inches of the food and carefully inspecting it. Moths rarely go any deeper than 4 inches from the surface. 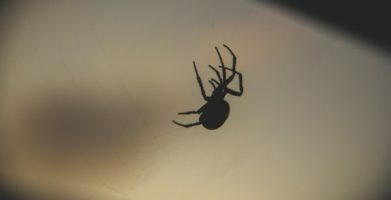 Look for tiny white eggs, worm-like insects, casings, and a white webbing–like that of a spider web. The webbing is formed when the cocoon is spun. Once hatched, you will notice the empty moth casings. If you have noticed any signs of a moth infestation in your pets’ food, it is a good idea to check any other dry food source in the home or surrounding area of the pet food. This is because the adult female moths continually sniff out the perfect place to lay their 400+ eggs. To prevent moths from inhabiting your dog’s or cat’s food, dump the entire bag into an air tight container after thoroughly inspecting it. Any nearby moths will not be able to sniff out or gain access to the food, and will move along. Keep any other dry food that is in the area in air tight containers or a freezer, if the food is freezer friendly. Promptly recycle or remove any boxes or packaging that the food came in because moth eggs may be hidden inside the corrugate of cardboard boxes. 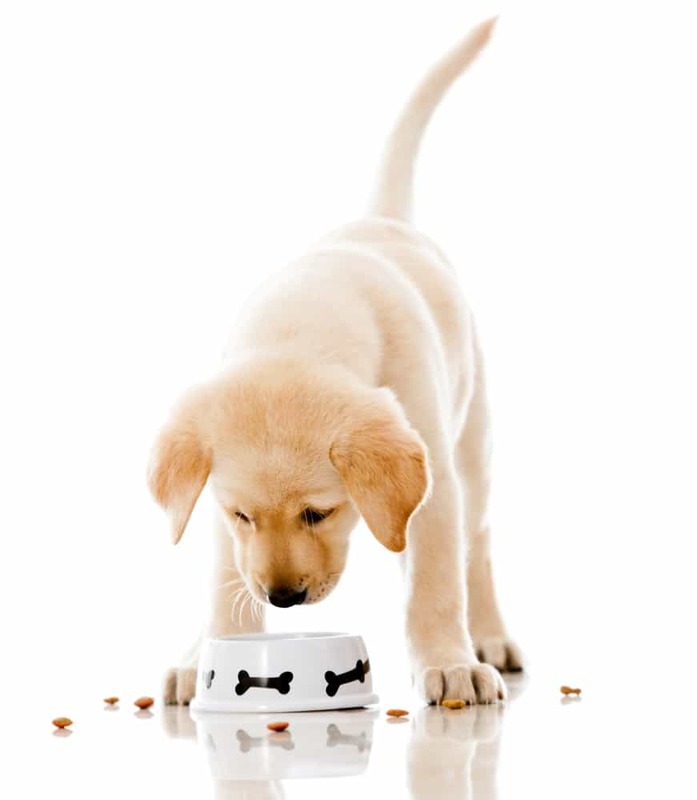 Clean up any areas where traces of pet food may be present. Vacuum and wipe away any crumbs in the surrounding area of the stored food. 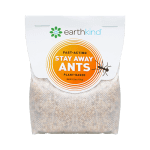 Doing so will eliminate any attractants that may lure moths into the space. 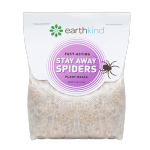 In addition to cleaning, place a pouch or two of EarthKind®’s Stay Away® Moths wherever pet food is stored. Two pouches per room are recommended for the most effective moth prevention. 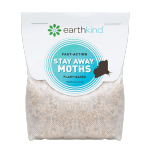 Stay Away Moths works by using a blend of essential oils that smell offensive to moths, but pleasant to humans. The scent obscures the food aromas and other odors that moths seek when looking for a safe place to lay their eggs. Avoiding chemicals is the key goal when dealing with your loved ones and fur babies. Chemicals are not necessary and should be kept far away from your four-legged family. For more information and control methods on Pantry Moths click here. I have had the same problem with Purina bagged dog food. 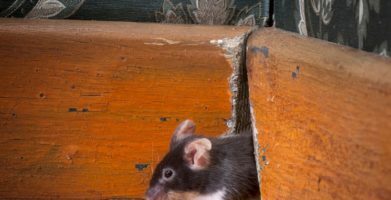 After these moths came in my home in a box of dog treats, I immediately threw the treats out, but a few were left to find another nesting place in my home. So I sealed up all my dog food , except for a larger box of dog treats I had already opened. The moths did find the open box and settled in. Without fully opening the box, I taped it shut and put it in plastic bags and put box and all in my outside garbage can. I think that is the end of them. But will see in a few weeks if they reappear. It definitely sounds like you’ve taken all the right steps to get the moth problem under control. Thanks for sharing, and please keep us posted on how things are going! I just purchased a plastic pail (8KG) of Purina Dog Chow and it was full of adults moths that flew out in a cluster as I opened the pail. I immediately put the pail outside (-14’C) and will throw it out on garbage day. Now to secure my other dry goods! Yuccch! That’s a bummer, but it sounds like you’re taking the right steps to control the moth problem! Storing food (including pet food) in sealed, airtight containers is definitely the best way to prevent moths and other pantry pests. And it wouldn’t hurt to use a few pouches of Stay Away Moths for added protection. We have been having this issue for 2 years . Before that we never saw these moths, worms. We have been using Purina Beneful healthy weight and the last 2 bags have had the issue. It seems that Purina would be aware of this issue and either freeze their bags before distribution or make a sealable bag. Higher end pet foods do not seem to have these issues and I believe it is because their bags are much better quality and of material that is inpenatratable to insects. Purina and others that have this moth issue need to fix this possibly with better quality bags for their food or a freezing before distribution method to kill any possible moth stages. Just a thought. We are all very frustrated on this problem!! Noticing an infested bag of pet food may be difficult. The moths are likely to still be in their early egg stage. During the egg stage, the moth only measures about 1-2 hundredths of an inch. After hatching from the eggs, the larvae will measure up to ½ an inch and have a worm-like appearance. If you are not inspecting the food, which most of us aren’t, you will not recognize a moth problem until you spot an adult moth flying around. If there are clear signs that moths have been inhabiting your dog’s or cat's food, the food should be sealed up and thrown away. Sealing up the package before disposal will help ensure that other foods will not be contaminated as well. If there are other dry pet foods nearby, or foods that are in contact with the infested food, be sure to check them thoroughly. If they show no signs of moths, we recommend freezing the food for a week to kill any remaining eggs, just to be safe. The good news is that the pantry moth does not carry any diseases that will harm you or your pet. There is no need to worry if your dog eats food containing moths at any stage of their development. Although pantry moths are not a significant health risk, they are still unsightly. If the thought of serving your furry friend infested food sends shivers down your spine, take the time to check food for a moth presence. You can do this sifting through the first 4 inches of the food and carefully inspecting it. Moths rarely go any deeper than 4 inches from the surface. Look for tiny white eggs, worm-like insects, casings, and a white webbing--like that of a spider web. The webbing is formed when the cocoon is spun. Once hatched, you will notice the empty moth casings. If you have noticed any signs of a moth infestation in your pets’ food, it is a good idea to check any other dry food source in the home or surrounding area of the pet food. This is because the adult female moths continually sniff out the perfect place to lay their 400+ eggs. To prevent moths from inhabiting your dog’s or cat's food, dump the entire bag into an air tight container after thoroughly inspecting it. Any nearby moths will not be able to sniff out or gain access to the food, and will move along. Clean up any areas where traces of pet food may be present. Vacuum and wipe away any crumbs in the surrounding area of the stored food. Doing so will eliminate any attractants that may lure moths into the space. string(58) "Pantry Moths in Dog Food & Other Pet Food - What to Do"